In a small bowl, whisk together yogurt, olive oil, apple cider vinegar, lemon zest, dill, and salt and pepper until creamy. 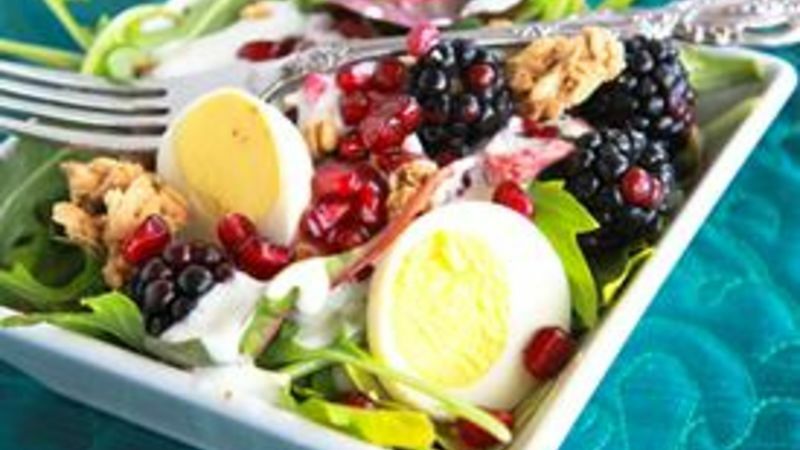 In a large bowl, toss together the greens, pomegranate seeds, blackberries, pancetta, granola, and sliced eggs. Drizzle dressing over greens mixture. Serve and enjoy! When I was a little girl, our neighbors had a pomegranate tree. We once walked by it and my mom said, "See that tree? Those are pomegranates. They're really good, but so messy! So I'll never buy them." My poor mama, she went all those years without those mouth-popping arils all over her recipes, simply because she hadn't learned the glorious secret that is The Easiest Way Ever to Open a Pomegranate. Start with a pomegranate and a clean bowl of water. Slice your pomegranate in half with a sharp knife, then dip it right into your bowl of water. Now, keeping it submerged under the water, just pull that baby apart. Gently slide your fingers in and around the seeds, loosening them from the edges and pith of the fruit. You'll start to see the arils (seeds) falling to the bottom of the bowl, and the pith floating to the top. How's that for fabulous?! Simple pull the pith from the bowl, then drain the seeds and run a little fresh water over to make sure they're spiffy clean. 1. Make your favorite Betty Crocker Cake and top with fresh whipped cream and pomegranate arils for a beautiful, natural version of sprinkles! 2. Toss them into our brand-new recipe for Fruit & Granola Salad. You won't believe how clever the combinations of sweet and savory work together in this dish! (nab the recipe below). 3. Pop them over a plate of fluffy Bisquick pancakes, or homemade French toast. 4. Open a carton of Yoplait Greek 100 yogurt, pour in some pomegranate arils, then munch and crunch away. 5. Top your asparagus with them. There's no reason you have to serve asparagus all nekkid and plain. No way! Use fresh pomegranate arils to lend flavor and color with this gorgeous recipe for Asparagus with Pomegranate, Toasted Walnuts, and Bleu Cheese. 6. Top your tartlets with them. This easy Pomegranate Tartlets recipe from Pillsbury will show you how to make a bejeweled dessert in minutes! 7. Turn them into a sauce and zest up your chicken! This recipe for Seared Chicken Cutlets with Pomegranate Sauce is just utter perfection. 8. Go Granita! Turn your poms into juice, then mix them into a sweet Blueberry Pomegranate Granita. Easy to make, even easier to eat the whole batch! 9. Add some color to your cocktails! Like with this recipe for Pomegranate-Ginger Cocktails. About as pretty as pomegranates get! 10. Spice up your salsa! Toss the tomatoes, pomegranates are in town. And this recipe for Quickie Pineapple Pomegranate Salsa is outta this atmosphere delish. Brooke blogs at Cheeky Kitchen, where she shares fun family recipes. She joined Tablespoon to share some of her best, so keep an eye on Brooke's profile to see what she cooks up next!